Screw down the wire contacts on to the bare electrical wire only and do not clamp down on the insulation of the wire. Bad contacts cause sparking which may cause the cord to heat up and may damage equipment. Repeatedly shutting down the tool without allowing it to cool adequately may cause the element to crack; the cracking of the ceramic element may also cause the mica tube to burn or peel. A plugged air intake will cause bad welds. Regularly check that the air intake is clear. Clean it with a soft brush when needed. Do not turn the heat on right away the next time the tool is started as there is a risk of damage to the element and mica tube. Run the blower or tool without heat for 10 minutes so that the moisture is safely blown off prior to slowly increasing the heat to the desired level. The welding shoe must only be changed when the tool has attained its operating temperature. Wear temperature resistant gloves. Every time the welding shoe is changed, clean the extruder nozzle (19) of welding residue. The extruder nozzle has a left-handed thread. Make sure that the nozzle is screwed in tight by turning it counter-clockwise using a 13 mm wrench. Put the new tire in the hot soapy water. VARIMAT drive wheel: Remove the green round belt and the 8mm hex bolt and washer; pull off the wheel; remove the parts inside the rim. Take the key out of the keyway in the axle so that it does not fall out and get lost while the rim is off. VARIMAT rocker wheel, UNIMAT V narrow wheel, HEMTEK upper wheel: Remove the 8mm hex bolt and pull off the wheel. UNIPLAN narrow wheel: Use an external circlip removal tool to remove the circlip. Then follow step d.
VARIANT T1, UNIPLAN, UNIROOF E, VARIANT, UNIFLOOR; MINIFLOOR: Turn the tool on its side and drive the wheel until the set screw on the inside of the rim is visible. Loosen the set screw with the 2mm hex tool and pull off the wheel. UNIMAT V Tape wide wheel: Remove the 8mm hex bolt and washer; pull off the wheel. Take the key out of the keyway in the axle so that it does not fall out and get lost while the rim is off. HEMTEK lower wheel, or UNIROOF AT/ST: Loosen the two screws on the side of the wheel with the 2.5mm hex tool, and remove the plate. Pull off the tire and the ring under the tire. Cut the worn tire off with a utility knife. Clean any tire residue off of the rim. Repeat this motion to push the tire further onto the rim until the tire is on almost all of the way. Use the heel of each hand to push the tire on the rest of the way. Check closely that the tire is inside the edge of the rim all the way around. 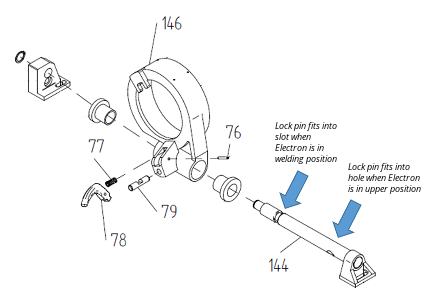 ​Many of Leister’s tools utilize a lock pin to hold the nozzle in position during welding and cooldown. The lock pin is designed to snap if excessive force is put on the heater in order to prevent more expensive damage to the tool. The most common reason for a lock pin to bend or break is the tool being lifted or carried incorrectly. The correct methods of carrying the tool are with both hands under the frame, or with one hand under the frame and the other holding the black carrying handle. In this guide, parts will be referred to using the numbers indicated in the VARIMAT V drawing below. As an example, see lock pin (79). This is a simplified drawing. ​Note: Always change both brushes at once. If one brush needs to be changed, change them both. If your VARIMAT is not powering down completely but you suspect a power problem, check your power source. Check that the total power of all tools connected is not more than 80% of the continuous power rating (not the standby power rating) of the generator. Heat transfer and element life depend upon good air flow: do not block the air flow by allowing a kink in the hose. It is recommended the BITUMAT be run with the temperature dial lower than 9, and not at 9 or 10. The nozzle is not plugged or bent. The back end of the ELECTRON heater (the air inlet) is not clogged. If it is, tilt the Electron up so that the air inlet is down, and clear the air inlet opening with a soft brush. The nozzle is not wet. If the nozzle is wet, heat the BITUMAT at minimum heat to dry the element first before applying maximum heat. Brush bitumen away from the nozzle end so that the nozzle is not plugged. Turn the heat down to minimum and leave the blower on for 5 minutes to cool down the element.